At All Seasons we welcome guests into our home so they can come and enjoy the beauty of The Lake District. We are here to accommodate all guests that stay and help in any way we can to make everybody's experience as relaxing and comfortable as possible in England's most stunning destination. All Seasons Guest House and All Seasons Rest are two small traditional stone built houses next door to each other, ideally located in the heart of Windermere village just 200 yards from the train & bus station and short walk to the Lake and Bowness-on-Windermere, making it easy to explore all the highlights the Lake District has to offer. Breakfast- This is not included in the price shown, it must be added as an additional if you wish to enjoy a breakfast in the morning. Served 8.45am - 9.30am you get a choice of a continental and a cooked English Lakes Breakfast to start to the day. 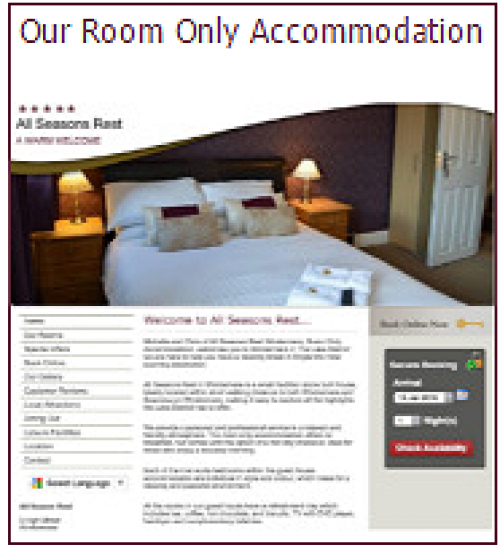 Our rooms consist of cosy Doubles, King size or Family rooms we have something for everyone. Not all are en-suite so if you require this please make sure you contact us direct this is clearly marked in our room descriptions. All rooms have crisp linen and lovely fluffy towels which makes for a comfy break. There is also a wide variety of information on the local area, including walks in the Lake District as well as books and magazines. These rooms is perfect for the budget traveler with all the modern amenities you need for your stay. This cute double room is on the second floor with low sloping ceilings at the back of the guest house, making it the quietest room of all. Our largest room in the guest house, it sits at the front of the accommodation with views of the town and mountain tops. This room is on the second floor with low sloping ceilings. The room contains 1 Double bed and 2 Single beds.